Diabetes is on the increase at a rate of 11% per annum and there is talk of an epidemic of diabetes. This is mainly due to a high GI, high fat diet consumed by the general public, as well as an increasingly sedentary lifestyle, increased stress and smoking. There two types of diabetes i.e. type 1 diabetes (10% of diabetics) and type 2 diabetes (90% of diabetics). In the former, the beta cells of the pancreas are unable to produce insulin and the onset is usually sudden. A pre-existing genetic component is usually present, as well as a precipitating factor eg. a viral infection or in some cases, certain proteins can spark off an immune response. Often it is a triggering factor that is the proverbial last straw for the person to become a diabetic eg. an infection, stress or trauma. These do not, however cause the diabetes. The classic symptoms of especially type 1 diabetes are chronic thirst, chronic urination, chronic hunger and massive weight loss in spite of consuming large amounts of food and drink. Type 2 diabetes is less easy to diagnose than type 1 and the onset is usually slow. 30% of type 2 diabetics already have complications at the time of diagnosis. Usually these people are overweight, have insulin resistance and already have high cholesterol and/or high triglycerides and high blood pressure, by the time they are diagnosed as being diabetic. They often have no or vague symptoms eg. chronic infections, chronic fatigue, pain/cramps/burning sensation in the legs and feet, shortness of breath, etc. Some of these people have a relative insulin deficiency and can be treated with diet and exercise alone, or diet, exercise and tablets. Others have an absolute insulin shortage and need to be treated with diet, exercise and insulin therapy. Early diagnosis is important, so whether you have any of the above symptoms or not, have your blood glucose, blood lipids and blood pressure checked regularly. The earlier diabetes is diagnosed and treated, the less the chances are of serious complications eg. blindness, kidney failure, amputations, heart attacks or stroke. As with all new research, the Glycaemic Index (GI) has not been welcomed with open arms by everybody. It has its critics, who mostly cling to past assumptions due to fear of change. Unfortunately they prefer to believe what they think should happen to a persons’ blood glucose in response to eating certain foods, rather than facing what actually happens to blood glucose when carbohydrate rich foods are eaten. The Glycaemic Index, remember, is a physiological measure of the body’s response to a particular carbohydrate rich food. Research conducted over the past 20 years in Canada, Australia, the United Kingdom, Italy, France, Denmark, and South Africa, proves beyond a doubt, that many foods that were regarded as “safe” on the traditional sugar free diet, actually raise diabetics’ blood glucose levels exceptionally high. Some of the previously regarded “safe” foods elicit very high blood glucose increases and should therefore rather be avoided. Many other foods that contain sugar, which diabetics have had to avoid in the past, cause no major fluctuations in their blood glucose. It therefore does not make sense to forbid these foods for diabetics. By consulting the GI list, you will notice that potatoes have a high GI value, whereas sweetened fruit yoghurt has a low GI value. Therefore the new low fat, low GI diet is much more effective in lowering and controlling diabetics’ blood glucose, because it is based on what happens to real people (diabetics and non-diabetics) when they eat real food in real life. Umpteen dieticians across the world have countless examples of how diabetics’ insulin and oral medication can be decreased or even discontinued in some cases, when following the low GI low fat diet. Many of these people had been on a sugar free diet for many years and were still unable to get their blood glucose readings under 10 mmol/l. As soon as they went onto the low fat low GI diet, their readings went under 10 for the first time in years, not by avoiding sugar, but by avoiding high fat, high GI foods. It is actually upsetting to dieticians to see that many diabetics who have been following a sugar free diet for years, are in fact eating a high fat, high GI diet. This is especially serious, since diabetics are more prone to heart disease than the general public and many of these diabetics are overweight, and it is very difficult to lose weight following a high fat diet. We now know that it is actually fat that is the most fattening nutrient, and not carbohydrate or sugar, as many believe. INSULIN: A LOW FAT LOW GI DIET CAN PREVENT LIFESTYLE DISEASES BY PREVENTING THE OVERUSE OF INSULIN. A high fat diet also results in insulin working less effectively, which, in turn, can lead to a relative or absolute insulin shortage, hyperinsulinemia and consequently insulin resistance. This predisposes a person to all the lifestyle diseases ( diabetes, heart disease, hypertension and overweight). 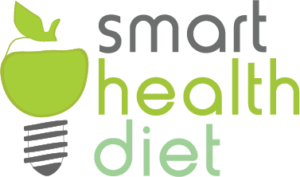 The low fat, low GI diet is also much more “user friendly” than the old diabetic diet, because sugar is no longer completely forbidden. Portion control is no longer so important when eating low GI, low fat foods as the increased satiety automatically controls how much is eaten. However, the overweight still have to watch their portion sizes. That is why we give the portion sizes in every recipe, so that those who want/need to watch their weight are able to do so by sticking to the recommended portion sizes. Larger portion sizes are, however sometimes given for those whose weight is normal or who need to carboload. Diabetics should also see to it that all meals eaten contain at least one low GI food. 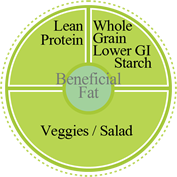 If most of the foods in a meal are low GI, then intermediate and even small amounts of high GI foods can be added to the same meal. Look for examples of this in the recipies. For maximum lowering of blood glucose, especially for those with a fasting blood glucose value higher than 8 mmol/l, and a random blood glucose higher than 10 mmol/l, it is important to consume low GI foods at every meal.